Three years ago, four Game of Thrones episodes leaked online before the season had started. As a result, millions of people turned to unauthorized sources to watch them. New research shows that this had a long-lasting negative impact on the official viewership of both Game of Thrones and related shows. HBO was understandably upset and feared that the leaks would hurt their bottom line. While that was not immediately apparent after the official premiere, new research suggests that they had a significant impact. And not just on Game of Thrones. “The general conclusion is that the leak provided a strong incentive for some of the viewers to look for unauthorized sources for TV shows and that, in consequence, some of them started watching TV shows through unauthorised channels in general,” Hardy tells TorrentFreak. The reasoning behind this effect is that the leaks introduced some people to these unauthorized sources for the first time. They then kept using these for subsequent episodes. Ratings, viewership and predicted viewership. For his research, Hardy used an extensive dataset of US TV-viewership of a variety of shows over time, as well as related Google search data. This revealed that other series, similar to Game of Thrones, were negatively impacted too, compared to a control group. 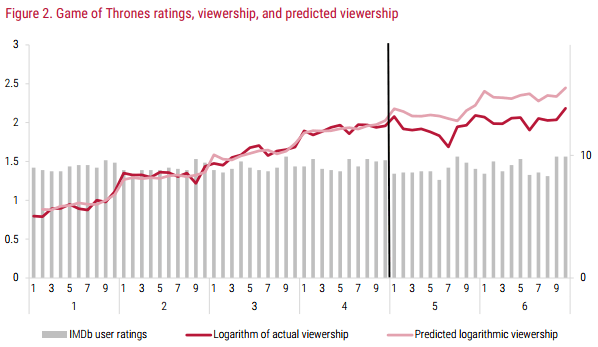 “Importantly, a negative shift in viewership was found, evidenced both by a drop in the viewership of GoT and by a decline in the viewership of TV shows that share an audience with GoT,” Hardy writes in the paper. This makes sense, as newcomers to pirate sites are likely to use them for other content as well. That this appears to be a direct effect of the leaks is evidenced by the fact that the decrease in expected viewership wasn’t visible for unrelated TV-shows. The findings are backed up by Google search data too. Following the pre-release leaks, Google search phrases linked to unauthorized viewing (such as ‘show_name watch online’) gradually increased for GoT-related shows, relative to a control group. The key message of the current research, according to Hardy, is that even temporary piracy incentives such as pre-release leaks can have long-term effects. They only affect a small percentage of the total audience, but every lost viewer costs money. This is bad news for HBO and others who have been in a similar situation. However, the data also shows that there may be a promotional effect, possibly because people discover new shows. As searches for unauthorized sources increased, the viewership of GoT-like shows slowly recovered. This suggests that there may be a promotional piracy effect, where people start to watch shows legally after discovering them on pirate sites. “On the one hand, this means that the content providers should pay much attention not to incentivize their audience to switch to unauthorized sources to avoid losses,” Hardy says. Follow-up studies may provide more clarity on this and other effects. A copy of the full working paper, titled Pre-release leaks as one-time incentives for switching to unauthorised sources of cultural content, is available here (pdf).